5. A gum-dental infection sample from an individual that does not outwardly manifest Morgellons symptoms. 6. A gum-dental fibrous sample from an individual that does not outwardly manifest Morgellons symptoms. 7. A saliva sample from an individual that does visibly manifest the Morgellon symptoms. 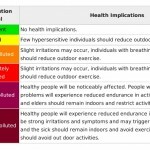 I state again that I offer no medical advice or diagnosis of the conditions that are being reported here. I have no medical expertise and I claim none. I am offering a series of observations and analyses from the standpoint of independent research. 1. The sub-micron spherical or oblate structure referred to repeatedly in recent papers. The best assessment that I can offer to date about the nature of these organisms centers on Chlamydia or Chlamydia-like bacterial organisms, with a special emphasis upon Chlamydia pneumoniae. 2. The filament form is also referenced repeatedly on this site. The filament is composed of two primary aspects: an encasing filament and a sub-micron internal fibrous network. One logical interpretation of this form is that of a delivery mechanism, since it is repeatedly shown to encase the three primary forms that have been observed. 3. The third form repeats itself sufficiently to warrant description. 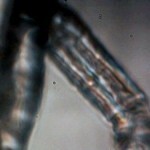 This form appears to be a morph of the previous two; i.e., it shares both the oblate and the filament characteristics mentioned above. The closest match that I can provide to date on this variation centers on certain forms of mycoplasma that have been researched. For the time being, this will be referred to as the hybrid form. The individual presented here has had a persistent dental-gum condition for several years. This individual does not outwardly manifest the Morgellons condition. The problem was first identified in December of 2003 with the extraction of a fibrous network from within the gum. Subsequent attention to the problem resulted in the disturbance moving from one portion of the gum to another over a period of several months. A phototropic response with the use of laser light was also reported. Eventually the afflicted region became stationary but increasingly difficult to access as the pain resides deep within the gum. Prior to this report, microscopic magnification has not been sufficient to reveal the underlying structures within the affected region. It will be observed that the basic structural form within the gum sample is visibly and metrically identical to that reported in numerous recent reports on this site. An individual that does not outwardly manifest the Morgellon’ symptoms can, with sufficient internal testing, demonstrate the internal Morgellons symptoms of blood disturbance and Chlamydia-like form. Chylamidia-like structures measure at the sub-micron level.. This individual does not outwardly manifest the Morgellons symptoms. The initial stages of transformation to the hybrid form. Both oblate and fibrous forms are visible. Gum-dental infectious sample subjected to the Gram stain process. The hybrid state is visible here, characterized by a transition to a more fibrous form. Similarity to mycoplasma forms is worthy of consideration. 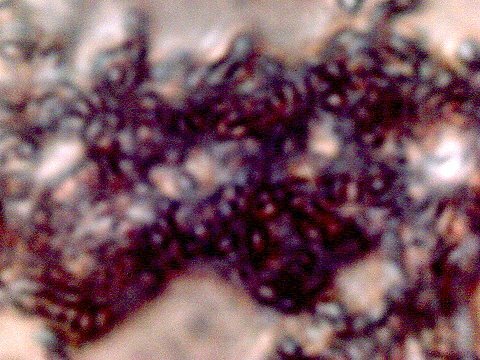 Blood cells of this same affected individual that have been subjected to the Gram stain process. Numerous intracellular structures visible (Chlamydia-like). Hybrid form also visible(mycoplasma-like also under consideration). Equivalence of form to dental sample is apparent. 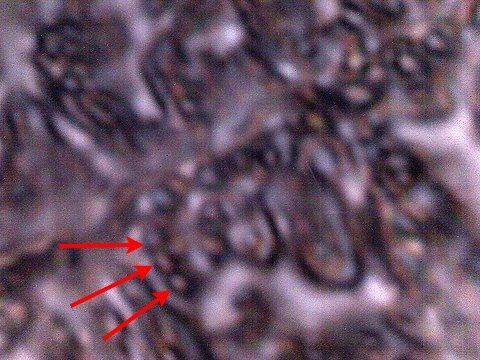 that appears identical to that of an individual that DOES visibly manifest the Morgellons symptoms. The individual here is the same as that described for the 5th match (Chlamydia like structures). The individual does not outwardly manifest the Morgellons symptoms. A more detailed examination of the gum-dental sample DOES reveal the presence of anomalous fibrous forms. 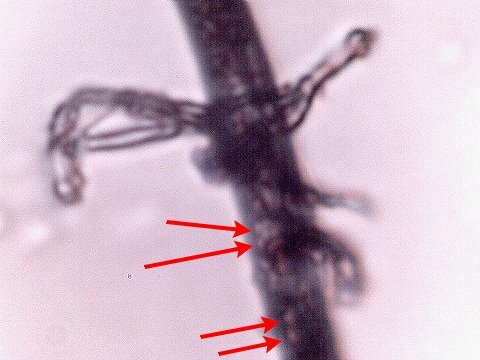 What is unique in this case is that the filament, as opposed to encasing a sub-micron fibrous network, instead encases the Chlamydia-like organisms. This demonstrates the real possibility that morphing between all three reported forms is frequently taking place. 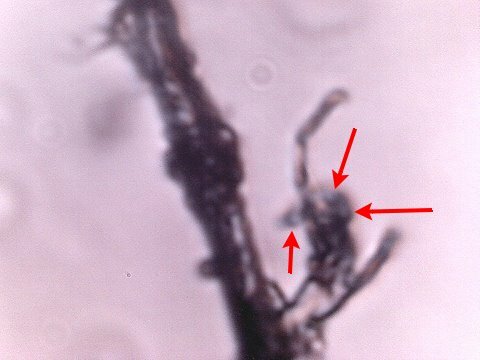 An individual that does not outwardly manifest the Morgellons symptoms can, with sufficient internal testing, demonstrate the Morgellons symptoms of anomalous fibrous form. The same subject demonstrates an anomalous fibrous form within the gum-dental infectious sample. 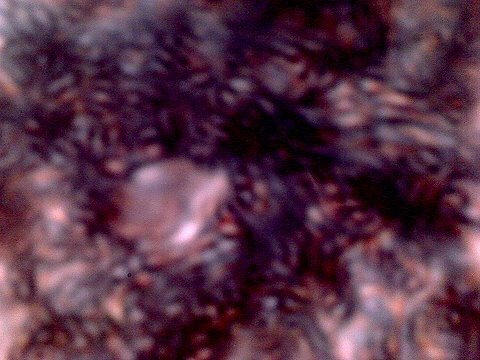 to that showing in an individual that DOES exhibit the Morgellons symptoms. 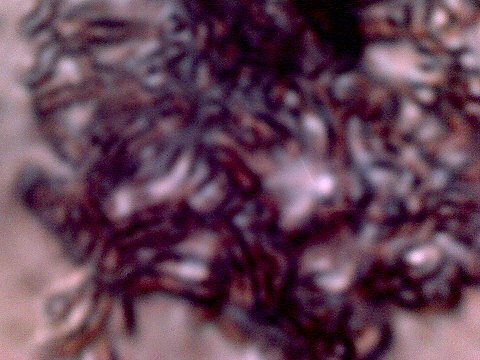 Outward appearance, therefore, appears insufficient to identify the existence of the Morgellons condition. Notice the unusual budding forms as referenced in previous work. Note the congregation of Chlamydia-like organisms on the bud structure(red arrows).. This individual manifests the Morgellons symptoms in pronounced fashion. 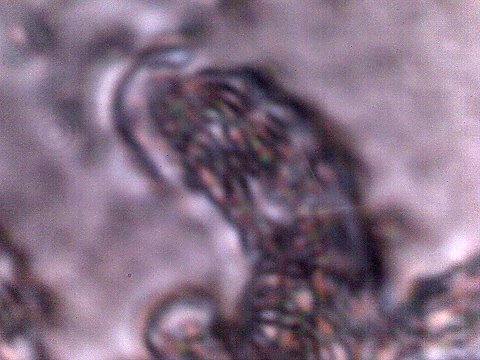 What follows are microphotographs of the”saliva”of that individual. This individual has long declared that this mucus is highly abnormal and that it reacts to ultraviolet radiation. It is to be mentioned that the sample from the individual was extraordinarily viscous and thick, and that it required “cutting with scissors” to extract a suitable sample for the slide. The mucus was allowed to dry on the slide prior to photographing. 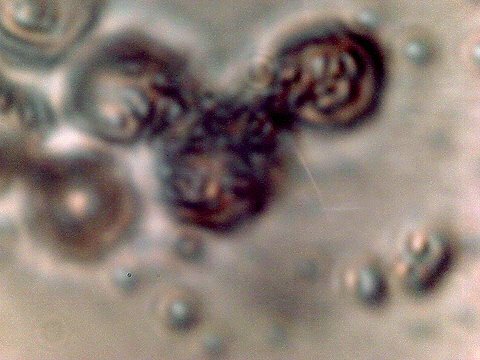 The detected Chlamydia-like structures, filamentous and hybrid forms are being detected across major systems of the human body, including circulatory, digestive and skin. An airborne source of similar form and size has been identified. The repeated detection of airborne dessicated erythrocyte forms and subsequent extraordinary culture results must be considered in relationship to the anomalous blood conditions that are being observed on a widespread basis. It may be appropriate to investigate the filamentous form as an encapsulating, transporting, extension or delivery system of chlamydia-like and mycoplasma-like organisms. The pathogenic forms may be distributed across major segments of the general population. The response of the Centers for Disease control and of the U.S. Environmental Protection Agency has been and continues to be completely inappropriate and inadequate. The citizenry should not follow the scheduled restrictive and containing “response” by the CDC; the public should dictate the course along with the schedule of demands and their own expectations of progress and scope. It is not advisable to wait another year for a “preliminary” report. Any role of the military, including the participation of the Armed Forces Institute of Pathology, is to questioned as to its impartiality and intent in any investigation. The public interest remains to be served. 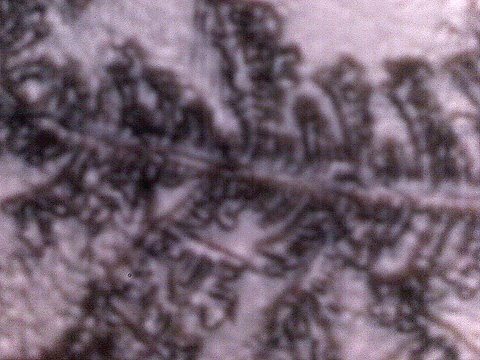 At relatively “low” magnification, the”saliva”appears to have a crystalline or dendritic form. This individual does visibly manifest the Morgellons symptoms. 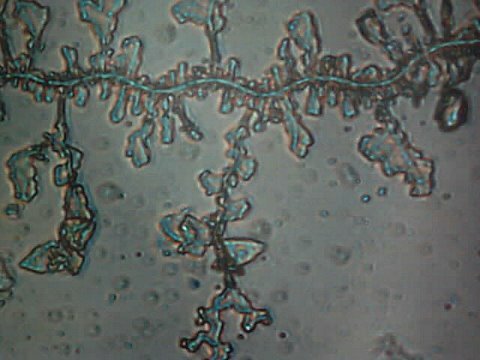 At high magnification, the dendritic forms take on increasing complex form. 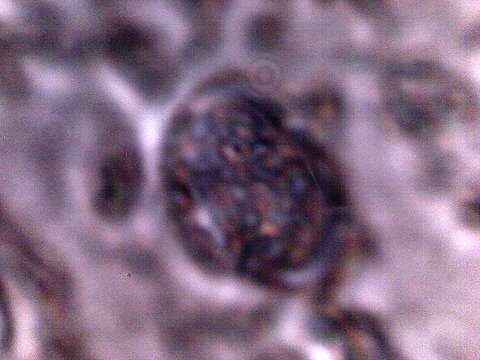 At the highest magnification available, considerable internal structure is again apparent. Identical Chlamydia-like forms are now found within the “saliva” sample(red arrows). of the body, including circulation, digestion and skin. A potential airborne source of the structures has been identified. The hybrid form is visible within the “mucus” sample. Both Chlamydia-like structures and the hybrid forms are visible within the mucus sample at sufficient magnification.